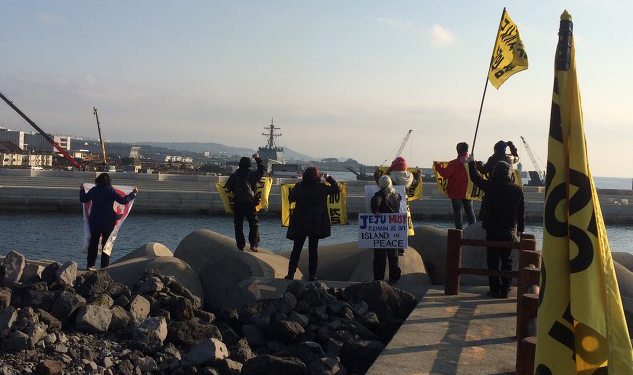 Photo by K. N./ Following Dec. 1 when a Jeju squadron was created for the 1st time (See here), 7th task flotilla entered Gangjeong on Dec. 22. The submarine squadron entered on Dec. 20. For more photos, see here. Once arrived in the port, we could see an ugly aegis destroyer being moored while another aegis destroyer coming around very close to the Tiger Island, the UNESCO-designated along with its nearby sea. We shouted out, “No Need of Task Flotilla in the Peace Island! Go away, Aegis!” A giant group of birds flew in the sky, as if they felt something dangerous over the sea. The sea looked crying as 70 years before when the Island was blooded by the April 3rd incident. Photo by K.N. /A warship is coming very closely around the Tiger Island, a UNESCO designated Island. The ship’s sea route interludes the UNESCO biodiversity area. For more photos, see here. 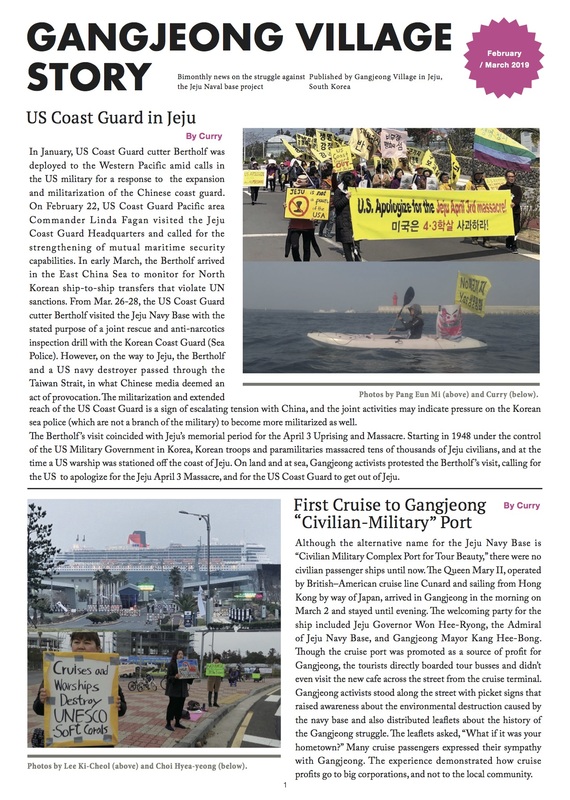 We are now witnessing once a pristine UNESCO-designated Jeju Sea to become a horrible stage for the missile defense (offense) system, a key for the aggressive ROK-US-Japan trilateral military alliance.